Crazy, that’s what Kathryn said I was. That was a statement she made when I said I was continuing with my 30 day challenge of getting up at 5.30 a.m. every morning (well week days anyway). I am into my 4th week and as the weeks progress, it is a habit I am enjoying. 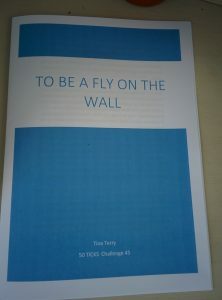 Reading the book, Challenge Yourself, I Dare You, has certainly inspired me to get on with my challenges and today I have 25 days left to finish. 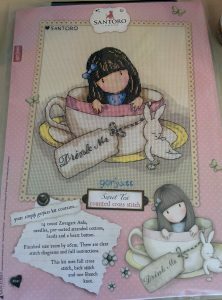 I also added another to the completed list; I have finally finished my Sweet Tea cross stitch. I actually started this challenge in August so it has taken me 9 months to complete. 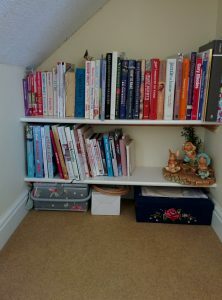 This challenge, no 29 – start and complete a new sewing project has to be on the top 10 of my favourite challenges. It has made me restart a hobby that I enjoyed and made me a bit more disciplined. 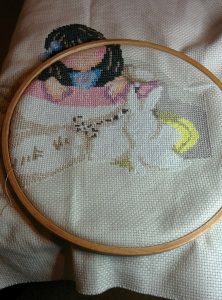 Apart from this week when I have devoted all spare time into doing my back stitch, I have tried to put aside time during the week whereby I can stitch. I am hoping to continue and carry on with my next project that Jordan bought me for Mother’s day (well with a bit of a hint from me!). 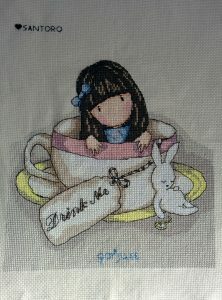 Joining a cross stitch group encourages you to complete your project! Whilst enjoying the other stitcher’s achievements, don’t compare their timings. I am a plodder when it comes to most things so I tried not to get disappointed when someone else did the same project in 3 months! Find your own methods that work for you. 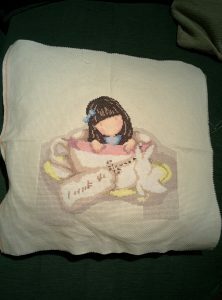 I always start in the centre of a design as instructed and I always save the backstitch to the end. Other than those rules, I work my own way. When you make a mistake, if it’s too late to unpick, work round it. Don’t let it put you off. I did make a bit of an error and it did hold me up, but then I decided to stitch in another place and work it out at the end. I did just that and I don’t think it makes a difference. Just makes it unique. Don’t think you hate a stitch and allow it to put you off. I had a dread of back stitch. It took me five days to complete it but I really enjoyed it. I will not dread it so much in the future as it made me so happy when I saw the picture coming to life (even the drunk rabbit, Kathryn!). I was so overjoyed with my french knot (even if it is out a fraction. I can live with it!). Don’t open new project until one you are working on is finished. I am going to open it at the weekend. So I have now completed 30 challenges – just 20 to go! Maybe I need to get up at 5 a.m.! This Saturday, Chris and I set off with music on to complete challenge 22 – visit somewhere in England you never have before. There are lots of places in England I haven’t been so think I will make this a regular occurrence. For this challenge we were off to Goring on Thames. I do like villages and towns with water; I loved Arundel which had the River Arun running through. I actually plan to go back there. Another big favourite is Bourton on the Water, the Venice of the Cotswolds, with the beautiful river Windrush. 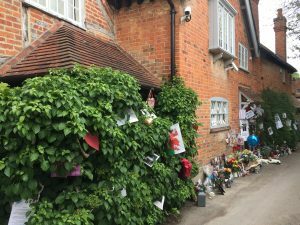 In this case, I actually wanted to go to Goring to say goodbye to my idol, George Michael. It felt a bit mad going but whilst I can never take the title of super fan, George has been part of my/our life. We love listening to his music and we chose to go to what would have been George’s last concert on our 25th wedding anniversary. We knew it would be a memorable day but we never thought it would be the last time George would perform. 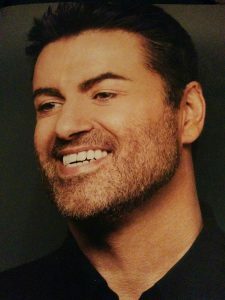 It was the day that I knew how much George’s music and his fantastic voice meant in our relationship. I did feel a bit weird asking Chris if we could go there but he was all for it. With George singing to us, we reached our destination by 9.20. 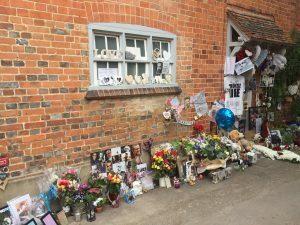 Chris had done more research than me and could point out George’s house as we approached the village from the bridge and we were able to see the many memorials left from the car. We parked up and headed through the pretty village and headed to see the house. I don’t know why I thought it was a bit mad, there were other couples (all our age!) 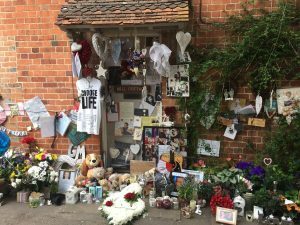 looking too, and four months on there still lots of messages from fans, fresh flowers, photos and funny items like a wispa bar and bottles of Tropicana. It felt sad that this was where my idol had died and that he would not be making any more beautiful songs. I would never meet my idol either; although I don’t think I had wanted to anyway. I don’t think he would have disappointed me; more than likely the other way round. I would have said something stupid or giggled like a little girl that I would have regretted forever! I much prefer idolising from afar. We visited a few shops and enjoyed a lovely breakfast in the village. Everyone is friendly in the village and we had a lovely chat with one shop assistant, a lovely South African lady who had a lovely tale to tell of how she came to be living in England and working in Goring. 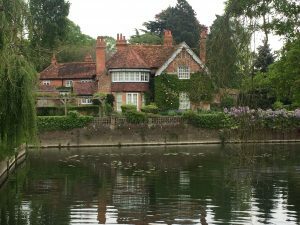 We then had a lovely walk along the Thames and enjoyed the views along the way including the full view of George’s house before stopping to have a drink at the Miller at Mansfield. On our way home, we stopped at Popham Airfield for tea and cake. As Chris had turned down the chance of a flying lesson to help me get my tick, how could I object. I actually do love visiting airfields so not a big deal! All in all, I have two boys that have to thank for helping me with this challenge, my husband and George, my secret love. I have taken advantage of this challenge and practiced this quite a few times really. 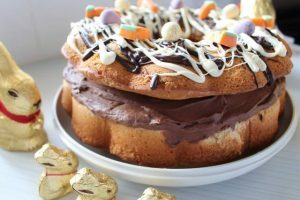 With the aid of the Baking club, I have made all sorts of cakes and bakes including biscotti, hot cross buns, banoffee cookies and a delicious chocolate honeycomb cake. 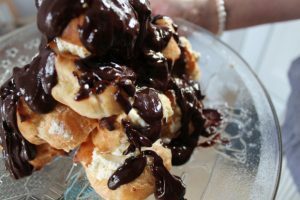 This month’s kit is for eclairs which I am keen to try after the success of the profiteroles. I have also made some lovely cakes from A Year of Cakes which I have loved. When I reached 50, I was quite trim; gained a bit of weight with all this eating but it’s worth it for the challenge! I thought I would celebrate the anniversary of the first date I had with Chris, by trying to bake an old favourite of ours which we would buy at a pub which Kathryn often visits now. I don’t think they serve food now but when we were her age, the pub had a display of delicious desserts; our favourites were cheesecake and the black forest gateau. 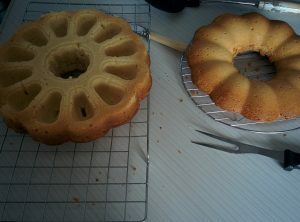 I have actually made both this week although the cheesecake was for part of another challenge. The challenge was originally to host a coffee morning for Macmillan or something similar. 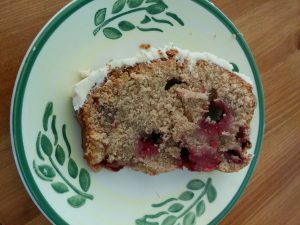 I did raise a little bit of money by baking this delicious bake and taking it to work but I wanted to do something at home. I decided to hold various events at home for our local radio station’s Cash for Kids charity and need to raise £100 by December. 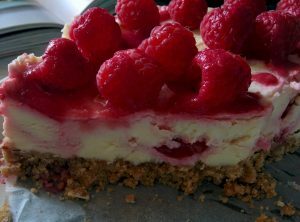 On Friday, I had my two friends for lunch and made a delicious White Chocolate and Raspberry cheesecake from Mary Berry Everyday (just a little hint here – would actually like the book!). I don’t think any of the cheesecakes we had at the pub had white chocolate in them but now I have discovered this one, I will be making it again. I am nearly half way to my £100. I would love to be there by the end of this challenge. I Love Cheesecake and Mary Berry! 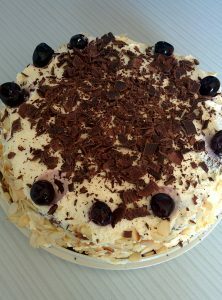 Now to the black forest gateau. I tried to make this many years ago but it didn’t go so well. I decided to use another Mary Berry recipe for this and had to make a fat-less sponge. My favourite cake to bake is using the all in one method so this was different for me. It mixed up well, baked well but I did have my doubts when I looked at the cooked sponge and had to slice it into 3 layers. 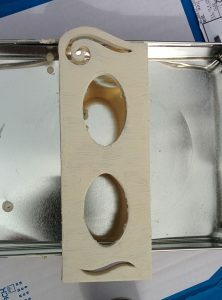 With the help of Chris, this was achieved and the finished result didn’t look too bad at all. One thing that I must look at in future is to maybe not to make so big; having said that we have made short work of eating the cake. I can confirm it was as delicious as the cake we used to buy at the pub. I might actually take a couple of weeks off the baking now! It’s been 24 days since I arrived in St Christopher’s Close. Just a small cul de sac; 15 houses in all. I’ve not had the pleasure of meeting all the residents yet but of those I have, I can vouch most are pleasant enough. As in any place, there are a few oddities but it wouldn’t be right for everyone to be the same. Whilst it has only been a short amount of time, I have certainly learned a lot about the people I have met and heard some gossip about one or two of the others too. I suppose it’s part of my job description to find out so much; some people would love to have the skills I have but it might only disappoint them. They would probably find they prefer their fantasy world. Today finds me at Janie and Barry’s for ladies tea and biscuit morning. I think I must be coming down with something to have accepted the open door invitation. I did visit on my first morning in the neighbourhood, took advantage of borrowing some sugar and fled pretty quickly. I really didn’t like the tone of Janie’s voice and the things she did with her arms. I don’t think for a minute that she works out but those arms are big. I look at the cakes she has to offer. Janie certainly doesn’t go out to impress; a supermarket chocolate swiss roll and rich tea biscuits. At least she has put them on a plate. Karen down the road always makes a superb victoria sandwich and those sweet melting moment biscuits. I am just dribbling thinking about them. Well hopefully Janie’s other friends will turn up with some goodies. The breakfast room is just a small extension off the kitchen. Janie and Barry live in one of the smaller houses in the close. I have admired those roses a lot. I don’t think that Janie can take the credit though; Barry likes to escape Janie’s nagging so when there is daylight, he is always to be found in the garden. Janie doesn’t seem to venture out there much. Now I am excited to see who else is here today. Oh no. It’s Anne and Penny. They never say anything; just listen to Janie gossip about everything and anything. If only I could get out of here. It’s so hot. An open window is what you would expect. I am really not feeling myself. How soon, is not too soon, to be seen as being rude to leave? I really must be coming down with something, I drifted off but I was soon brought back by Janie’s shrill voice. I’m sure she didn’t take a single breath. Unfortunately Anne and Penny seemed to be enjoying all the details of Janie’s poor neighbours’ fight. I actually feel I know the neighbours, James and Julie very well by now, and they certainly knew how to act well. Their two small children had been on a sleepover at their grandparents so James and Julie took advantage of a bit of free time to rehearse their lines for their local amateur group. Julie has been cast as a villain, which was not her at all; I know on good authority, she wouldn’t hurt a fly. James, hearing and seeing Julie in a totally different light, got a bit amorous. I will leave the rest to your imagination but let me tell you, don’t even go down Janie’s route of gossip. To be a fly on a wall would just not be interesting for her. Thinking about, she wouldn’t have known where to look on Friday! I see that Penny is making short work of that Swiss Roll. Not a pretty sight at all with her mouth wide open eagerly listening to the gossip whilst waving her hands trying her hardest to swipe something away. I really need to get out of this place. So hot. Trying not to let my head fall on the table. I must try to feign interest in this conversation. I concentrate on Penny to try to keep upright. Actually she is quite pretty in an odd way. I think she just has the wrong glasses on. Too big for her face. Wow she has the most amazing eyelashes. She is trying so hard to listen to the conversation but she is just swiping her eyes this time. Janie really needs to open a window or she will have us all fainting. The gossip has turned to the charming widow, Caroline. She took up running when her late husband was diagonised with cancer as a bit of release. She is very creative and was a seamstress by trade. Every now and then, her sewing machine is brought out to alter some friend’s outfit for a wedding. I understand that Caroline and her husband where very much in love and had lots of wonderful friends who like to look out for Caroline now that she is on her own. Measuring Bob’s inside legs for his best man trousers certainly would not have been innocent in Janie’s eyes although I can assure you that’s all it was. That bit was very boring but Caroline’s account of her wedding many year’s ago would have brought tears to anyone’s eyes. Whilst she had that faraway look in her eyes, she actually made you feel that you were sitting right with her as she quoted all the speeches made, the love between the newly married couple and the happiness of it all. She certainly gave Bob some ideas for his best man’s duties. I just knew that Karen would be a topic of Janie’s gossip. Janie doesn’t do much in her daily routine but trying to find some fault with the “perfect” Karen is Janie’s mission in life. 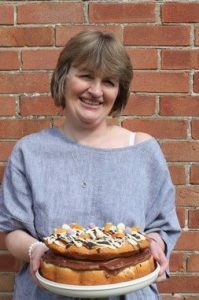 I start to swoon as I think of Karen’s lovely cakes; just a crumb would be delicious and the sweetness of the cherries on those biscuits would just be enough. I can certainly see why Anne has spilled her tea; I can confirm that Karen’s husband Joe’s bottom is pretty tasty. He works out all the time. I think he has to; he would be as fat as a pig with all that lovely food Karen conjures up. Mind you, Karen is a dietitian so she does cook healthy meals. She does live by what she teaches though; everything in moderation. Anne has gone very starry eyed. She certainly has a thing for Joe. I often see her spying out of her window when he returns up from work. Just another of her fantasy world she shares with her vast rag doll collection. She actually makes them and gives them to the local children’s hospital. Before giving them away, she tells them all her secrets; how she would loved to have married and had children but her priority had always to look after her elderly parents who she had nursed until their death. She has spilt her tea and it certainly looks like what I need…..
BANG….the place goes quite dark. Ouch that book is very heavy. I don’t think I am going to make this. I suppose that I have had more than my fair share of life. The fly community must seem very boring to the human, and I admit that we can be very annoying, but we certainly do get to know about people. After all, we are that fly on the wall that you humans would like to be. After reading the Challenge Yourself book, I did start getting up early. It was a struggle and for several days I felt it might have a negative effect but I can know say I feel great. Probably the turn around came with the weekend and not lounging in bed but getting on with things. Challenge 44 – go out for dinner and pick something that sounds awesome but you wouldn’t normally pick. I could have achieved this much earlier but than would I have gone out so much. One thing I have decided in my 50th year is to, where possible, avoid the restaurant chains and hopefully try something a bit different. Chris and I were off to cinema on Saturday. It is situated at Port Solent so there were lots to choose from. We opted for a fish restaurant. I like fish but don’t tend to order it. I am a bit ignorant with it and sometimes I don’t know how to eat it plus the bones put me off. I ordered skate wings which was delicious. 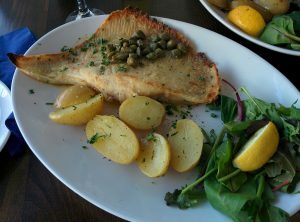 Not a fish I had tried before (more a haddock person) but will eat it again. Restaurant was great too. 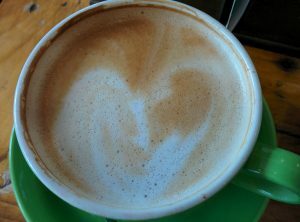 Challenge 45 – write a short story. It took me a while to be confident; gained this from the Challenge Yourself book. I really enjoyed this and even printed it in book form for the family to read. They were impressed. I will share later. Challenge 39 – mum and daughter pamper evening – bake whoppie cakes, eat cakes and watch 13 going on 30 and paint nails. I can’t believe that it has taken us so long to do this challenge and we have already seen 13 going on 30 once this year but it is one of my favourites. Who can resist a film with Mark Ruffalo in. The songs in it are amazing – Ice Ice Baby, I Wanna Dance With Somebody, Jessie’s girl etc. My favourites though are Thriller; fantastic dance scene and Love Is A Battlefield. 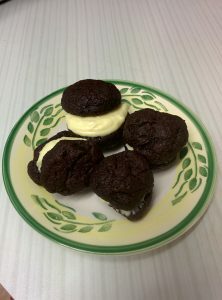 We made whoppie cakes from the kit I had been sent from the baking club. They were very yummy. Kathryn chose a red for me to paint my nails with whilst she went for a nice frosted cupcake colour for her own. 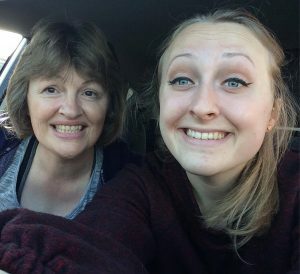 I am sure that we will be able to have lots of evenings like this once Kathryn has finished her degree. Not many days left for that either. I am still very optimistic that I will achieve all my ticks. 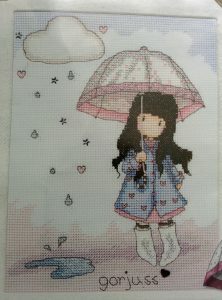 I am hoping to finish my cross stitch kit in the next couple of weeks which is a big achievement and frees me up to complete the others. 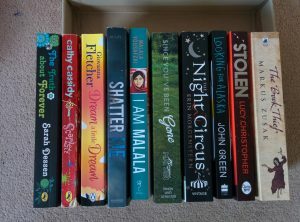 I might even have read Kathryn’s 10 favourite books on time too. Life is a battlefield at the moment but it is fun. 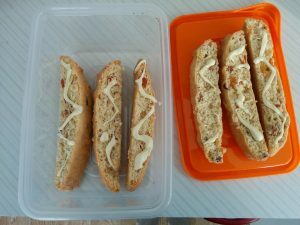 I have no idea why I have left all my cooking challenges to the end but here was one I was looking forward to attempting ; challenge 7 – cook a three course meal. 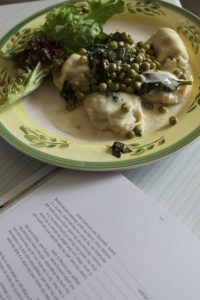 I decided that I would like to make this a family meal so Easter Sunday seemed like an ideal time; Jordan would be home from London and Kathryn was on Easter break busily getting ready for her finals. So first of all, let me take you to the corner of the house which I have taken over. 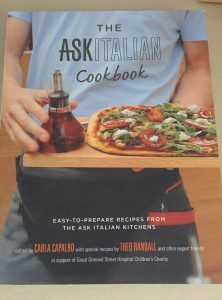 We really do have a lot of cook books. I thought it would be good to use these for my menu. 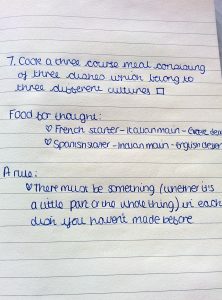 Cook a three course meal – with each course being from three different culture. There was absolutely no reason that I couldn’t have something British but I decided to try something different. There must be something (whether it’s a little part or the whole thing) in each dish that I haven’t made before. Fish cakes are one of my favourite thing. They are so much more interesting now than the ones I used to be served up as a child. So what was different about these for rule no two. I managed to get this passed; the use of crab. Never used it before and I don’t think I had ever eaten it before. 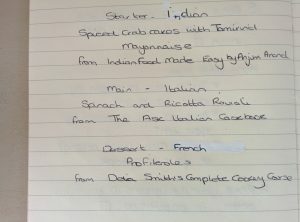 Whilst everything else I used was fresh; fresh ginger, garlic, coriander etc, I did use tinned crab instead of fresh. 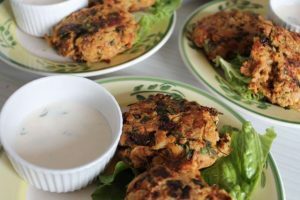 The actually cooking of the fish cakes brought a lovely aroma to the kitchen. I really enjoyed the preparation of these; George Michael play list kept me company as I chopped up the herbs. I prepared ahead and starting cooking just before serving. The finished result was very tasty and enjoyed by everyone. I had quite forgotten I had this book in our collection. I am looking forward to using it again. After the success of the pasta machine, I thought I would make my own ravioli. Was feeling quite confident about this. With the actual filling made, I proceeded to make the pasta. Things were looking good then very quickly the pasta didn’t seem to come out well. After a few minutes of panic, decided to just roll out the pasta manually. The result were what probably looked like dumplings. My family tucked in though and they were very tasty dumplings! Our local shop sell some very good fresh ravioli – might use this in future! 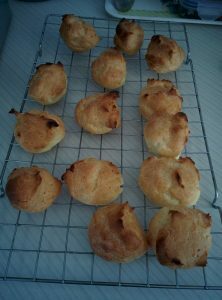 I try to avoid making pastry and have never made choux pastry before so I was quite excited about trying this. Kathryn helped me out with this and it was much easier than I thought. We were so impressed with the little buns when cooked. We decided to have a bit of a break between courses as the starter and main were very filling. The actual finished result was delicious. 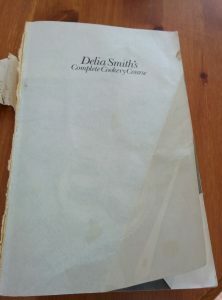 I have many recipes for this dessert but went for Delia’s because she spooned the mixture rather than piping. I didn’t want too much pressure. This was a wonderful challenge and one which I will be repeating in the future. Whilst not everything was perfect, I certainly had fun trying. 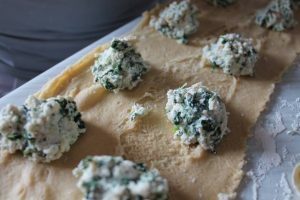 Crab cakes will definitely be on the menu again and I am planning on trying savoury choux buns too. 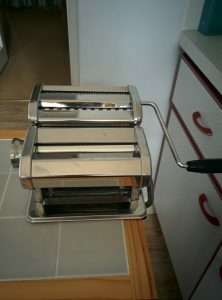 I haven’t been put off my pasta machine; I will keep trying. I can say half of my challenges are done. 49 days are left to complete the other challenges; it is possible. Two of my ongoing challenges are reading books, and one of them will be easy to complete. 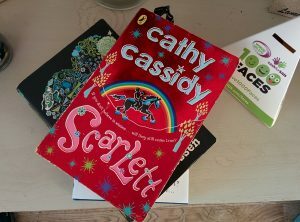 Not sure about reading Kathryn’s books but I will keep on and who knows. I did actually turn to a book to help me with my challenges on Friday. I had originally visited Amazon’s website to look for a book to help me with my write a story challenge. Reluctant to part with any money, and also to keep with my “let’s try and read the books I have already purchased challenge set by myself!”, I decided to check out my kindle library. I will explain that at a later date, I promise. 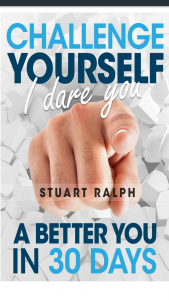 I came across a book I purchased in September 2014 (actually it was a freebie) called Challenge Yourself, I Dare You: A Better You In 30 Days! by Stuart Ralph. I thought it would be a good and quick read; good reviews and only 43 pages. I read it and it did inspire me. On Friday, I did a 30 minute run, unloaded the shopping, walked to the bottle bank, did the ironing, had a 30 minute visit from my sister, walked to shops to buy some forgotten items for the cake, made a lovely dinner, emailed the author of the book, baked attempt one of the showstopper challenge, walked 22,211 steps and made a very good start on my story. 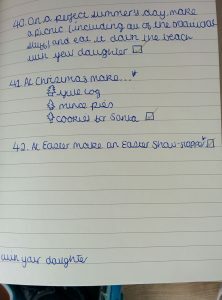 Most of those things would have been done on Friday. Starting my story was due to reading the book. The actual message is simple; take 30 days to give up or start something. I wish that I had read it before I started the challenge but better late than never. I felt the author was my friend and that he believed in my challenge. He encouraged me to believe I could do whatever I wanted. I am actually lucky as I am surrounded by people who do believe in what I am doing; my family. However, I don’t think they appreciated the fact that I now believe I can sing. Whilst making my three course meal challenge on Sunday, I did a brilliant duet with George Michael singing Don’t Let The Sun Go Down On Me. This morning I started on my 30 day challenge – I decided to get up earlier every morning to get myself organised so I could leave the house for a leisurely walk and not the run I normally do! Well first day and I started this blog post, did an exercise DVD, tidied the kitchen and arrived at work two minutes early. Good start but feeling very tired now. Hopefully I will adjust and get those challenges completed! I couldn’t do this challenge until Easter and was so excited to use my new tin. Wasn’t sure how the cake was going to be a showstopper but had an idea with the filling. 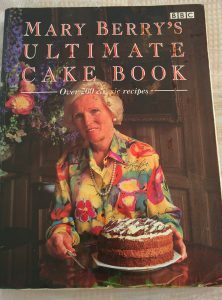 I have had Mary Berry’s Ultimate Book of Cakes for years and I never had the urge to make that delicious chocolate cake on the cover picture. I actually thought I would like to use the filling with our showstopper. It did mean using gelatine; not my favourite ingredient. First of all, the cake needed to be made. Now normally I wouldn’t worry about baking a cake. It was a bit of an unknown as the tin was a different size to our normal tins plus this wasn’t our normal Victoria sandwich. 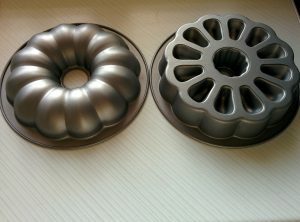 I decided that the best cake would be the vanilla cake recipe supplied with the tin as the measurements would be correct. 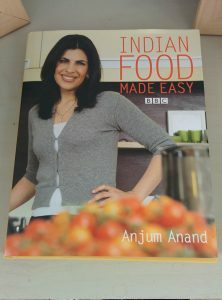 What I didn’t do which I normally would always recommend doing, is read the recipe, then read it again. Do this before you actually start to bake. The recipe hadn’t been printed correctly (that is my excuse and I am sticking to it!) and didn’t seem like a recipe I had followed before. Result was the cake didn’t smell right whilst cooking, it looked pale when cooked and the cake stuck to the tin. Friday night I went to bed very deflated . Kathryn also remarked that I wouldn’t earn a tick if it wasn’t completed. What a cheek, this was her challenge too! Remembering one of my favourite quotes; a winner never quits, I got up on Saturday morning, found a similar recipe on good old Google and baked again. A very good result. I had greased the tin with the “pockets” well, and with lots of help from Chris, the cakes came out of the tin in one piece. Now to use the gelatine. Good old Mary proved a very good friend here. She explained how to “sponge” gelatine (that had me scratching my head). Anyway after reading Mary’s tips on how you should sprinkle the gelatine onto the liquid and not the other way round and after a certain point to put the bowl into warm water, my gelatine was ready to be added to my chocolate mixture to make the mousse. 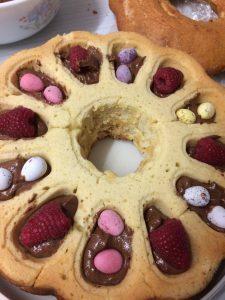 Thankfully Kathryn decided the artistic part of the cake belonged to her so she took over filling the cake bottom pockets with raspberries and mini eggs. We layered with chocolate mousse, added top layer on and put in fridge overnight. Kathryn did her artistic bit on Sunday morning, when she added melted chocolate drizzle over cake. Carrot and mini eggs became our decorations and we had made a showstopper that I am sure Mary and Paul would be proud of. Did I mention I did get a tick for this?! !